For the third time in eight days, the footballers of Bexhill United and Little Common will be on home soil tonight (Tuesday). Bexhill will host Southwick in round one of the Parafix Sussex Senior Challenge Cup, while Little Common will entertain Lingfield in Macron Store Southern Combination Football League Division One. Both clubs will be keen to continue the momentum following excellent results at the weekend, Bexhill winning 5-1 at home to Billingshurst in Division One and Common triumphing 5-0 against Selsey in the Sussex Senior Cup. Bexhill played Southwick in the league as recently as September 17, and ran out 2-0 winners at The Polegrove thanks to goals from Matt Cunnington and Craig McFarlane. "Some of the other cups have been quite low on our priority list, but the Sussex Senior Cup is always one I like to do well in and get through a few rounds," said Bexhill joint manager Ryan Light, who last season was part of the coaching set-up at Hastings United when they won away to Crawley Town in the same competition. "It's the only cup where we can play a team from a higher level, and the chance to play at some of these nice big grounds like Hastings and Eastbourne Borough is a real carrot for the players. It's almost like our version of the FA Cup." Ashley Kidman might need to rest a troublesome back, but Bexhill should otherwise be just about at full strength for a match which will kick-off at 7.45pm. Common, meanwhile, can move up to third in the table with a victory against a Lingfield side which currently lies two points and three places behind them. 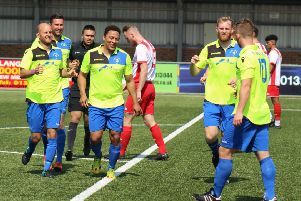 Russell Eldridge's team will be keen to reproduce the sort of form which swept aside Selsey at the weekend when Wes Tate scored a debut hat-trick and Lewis Hole bagged brace to take his tally for the season to 12. Common are unbeaten in their last six league outings and have lost just one of their last 10 matches in all competitions. Kick-off at the Recreation Ground is 7.30pm.